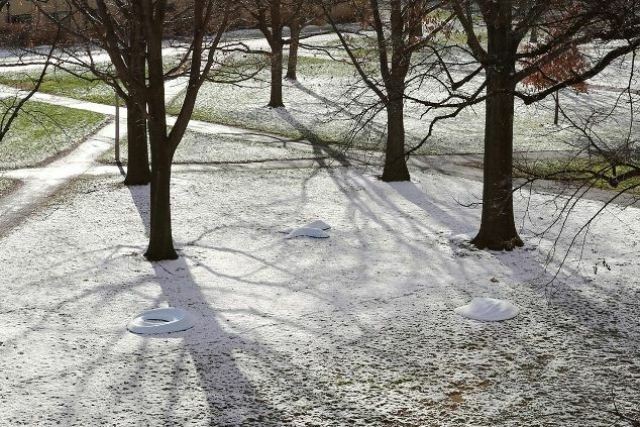 The trio of sculpted shapes on the east end of the Ag Quad near Warren Hall have remained steadfast this winter through snow and rain and sun. But the blue forms are more than whimsical art to engage passersby: those shapes are visions of what landfill architecture might look like in the future. Often seen as blights on landscapes, landfills as now designed are set far out of view to be piled high with what’s thrown away. But Katherine Jenkins, a lecturer at the Cornell University Department of Landscape Architecture, sees those spaces as missed opportunities. To test the concept of landfills designed as seamless extensions of their surroundings, Jenkins led a landscape architecture graduate studio course on a design project reimagining a space most people like to forget. For the course, students visited New York’s largest active waste-management facility, where a constant stream of refuse from across the state is added to Seneca Meadow Landfill’s flat-topped, pyramidal shaped garbage mounds that rise more than 300 feet above the surrounding Seneca County wetland. Cornell students made two trips to the site where they conferred with Seneca Meadow engineers and performed analytical mapping tasks. The course introduces students to concepts like terrain, volume, earth building and ecological systems, which the 13 students used to design alternatives for the site, Jenkins says. “The course challenges students to reconsider how landfills are constructed so that waste is used as a building material that generates topographies and ecologies that respond to the surrounding environment,” Jenkins says. As a parallel study to the course, Jenkins and her design partner, Parker Sutton, created the installations now on display at the Ag Quad. Made from the foam insulation castoffs from a building project on campus, the pair designed the forms with digital modeling software before cutting the 4 by 8 foot sheets using a computer numerical controlled milling router from the College of Architecture, Art, and Planning. At two inches thick, each sheet had to be milled and then stitched together to form changing elevations 12 to 18 inches above the base. Wooden dowels fit the forms in place, and designed cavities were filled with concrete as ballast to keep them settled for their installation outdoors. With varying texture, slopes and grade changes, Jenkins says the forms were intended to react to the ambient environment. The idea, despite the lack of snowfall for most of the season, was to seamlessly work within the topography, allowing snowfall to collect in certain areas while wind scoured clear other parts.